Mass production prospects are clarified both for the high output torque and long life durable microgeared motors with a diameter of 2.4 mm and the miniaturized pressure sensors with high sensitivity. 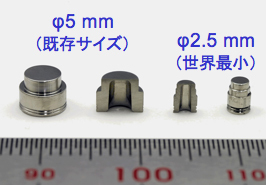 For the development of microgeared motors, IMR collaborated with YKK corporation and Namiki Precision Jewel Co. Ltd. IMR collaborated with YKK corporation and Naganokeiki Co. Ltd., for the pressure sensors. These achievements were reported in several newspapers and were broadcasted in TV news(June 6, 2006). By these outstanding contribution, Prof. Inoue (director of IMR,), Mr. Wakana (Namiki Precision Jewel) and Mr. Nagasaka (Naganokeiki) win the prime minister prize at the“5th Industry-Academia-Government collaboration summit”. High output torque and long life durable microgeared motor with a diameter of 2.4 mm. Miniaturized pressure sensors with high sensitivity.